The resort is situated on a beautiful, narrow 16 mile long stretch of land called the Fort Morgan peninsula. Just adjacent to the Beach Club is Bon Secour Wildlife Refuge which features miles of hiking trails, a 40 acre freshwater lake where you can fish, kayak or canoe, and a beautiful beach. It is also a popular spot for sea turtle nests. The refuge hosts large migratory bird stopovers in April, May, September and October. Our last trip in October coincided with the Monarch butterfly migration with thousands of butterflies through out the resort and the refuge. Close by is historic Fort Morgan. Built in 1812, it played a key role in the Civil War Battle of Mobile Bay. Now a historic site offering guided and unguided tours, a museum, and picnic sites on the bay. Also at Fort Morgan point you can take the ferry to Dauphin Island and visit the Sea Lab Aquarium. For the golf lovers award winning Kiva Dunes and Peninsula Golf Courses are minutes away. Within an easy drive in the Gulf Shores area add the typical family friendly venues of miniature golf, water parks, amusement centers, and an abundance of other beach attractions offering a diverse range of entertainment and dining options. 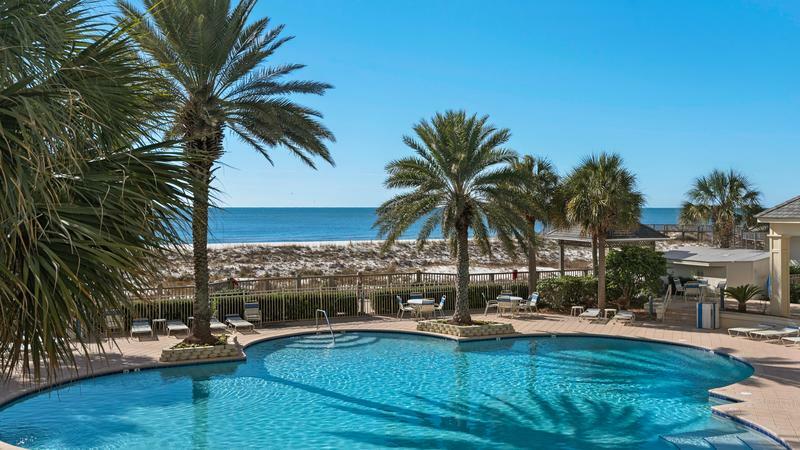 Whether relaxing with a book on the beach, visiting the onsite spa, gym or participating in a variety of available activities there is something for everyone at our Gulf Shores Beach Getaway at the Beach Club.